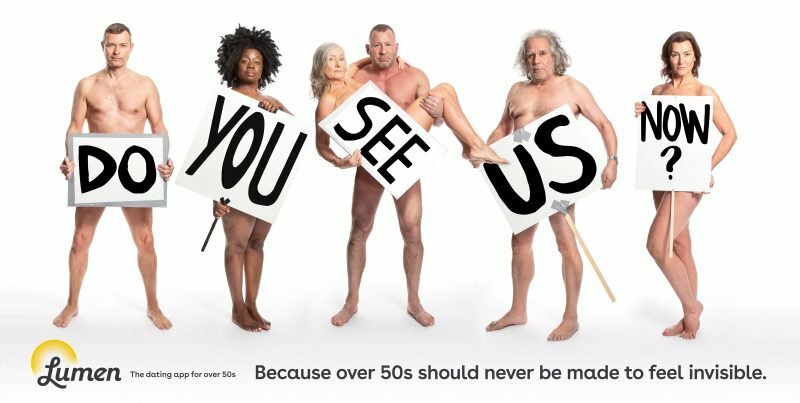 Six over 50s have stripped naked to protest advertising’s ageism in Lumen’s latest campaign. Lumen, an over 50s dating app, launched the billboard campaign after almost nine in 10 UK residents aged 50+ said that advertising targeted at them needs to change. The billboards feature slogans such as “Grey hair don’t care”, “Nobody puts Granny in the corner”, and “It’s our time to be seen”. The UK study also found that over half of over 50s think there’s too much airbrushing in ads aimed at them, and a third said advertising is ageist. Of those that disliked the ads, 23% responded that they feel ‘invisible’ from a lack of representation. Fashion, beauty, health and wellbeing, and travel and leisure were found to be the worst-offending sectors. “The fact that almost nine in 10 over 50s think that advertising aimed at them needs to change should be a real wake-up call to the industry about the ‘everyday ageism’ all around us. Not only is it a case of underrepresentation, but heavily edited images are making older people feel like it’s not okay to be themselves,” said Charly Lester, Lumen’s CMO and co-founder. Amey, one of the photoshoot’s subjects, added that the “tide is turning”. “Even though I still do all of the same things that I did when I was younger, I often feel like I am invisible because of my age and I don’t think that’s right. I’m here to say that women are not taking it lying down and we’re not giving up on ourselves,” she said. The images will appear on billboards across Australia from today. Whilst I dislike ageism, and want to see it gone, it’s important to remember the key reason why older people don’t appear in ads. People don’t like to think they are old. Would be interesting to see if portraying older people differently did alter that, but there’s always a fine line. Just as there is when showing weight. I thought all intelligent ‘mature’ people claimed advertising doesn’t influence their decisions so why are they now all up in arms that it doesn’t ‘represent’ them? Absolute total farce. Or are they just waiting with baited breath to what the next ‘influencer’ might ‘influence’ them to buy on an influencer blog site?